Extremely Rare Size Australian Boulder Opal (Ovl 18x13mm), Natural Cambodian Zircon Ring in Platinum Overlay Sterling Silver, Silver wt 6.40 Gms. Gorgeous and well-crafted, this cocktail ring features an extremely rare sized AAA quality Boulder Opal Triplet that has been beautifully set for a vintage appeal. Also featured are baguette shaped Natural Cambodian Zircons that have been precisely set on the ring’s shank adding great value and immense brilliance. Finished in Platinum Overlay Sterling Silver. Australian Boulder Opal Oval 18x13 Cabochon 1 6.650ct. Natural Cambodian Zircon Taper Bagguet 4x2.5x1.5 Faceted 4 0.550ct. Natural Cambodian Zircon Taper Bagguet 3x2x1.5 Faceted 12 1.150ct. Natural Cambodian Zircon Round 2 Faceted 12 0.650ct. 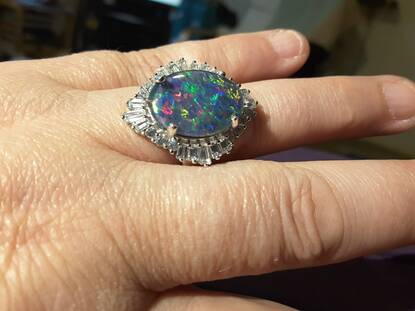 Verified reviews of Extremely Rare Size AAA Boulder Opal Triplet (18x13mm), Natural Cambodian Zircon Ring in Platinum Overlay Sterling Silver 9.000 Ct. Sits so comfortably on my finger, partly because the the actual ring is such a wide band and nothing rubs the adjoining fingers.